Today was a public holiday for the Melbourne Cup. A horse race and we get a day off. I got up early and headed north planning to activate SOTA summits Mt Ritchie VK3/VC-003, Mt Vinegar VK3/VC-005 and Mt Gordon VK3/VN-027. Activating these three summits would boost my points tally by 18 and would be a good re-start after winter. I arrived at the base of VK3/VC-003 Mt Ritchie at about 7:45 and was heading up the track about 10 minutes later. 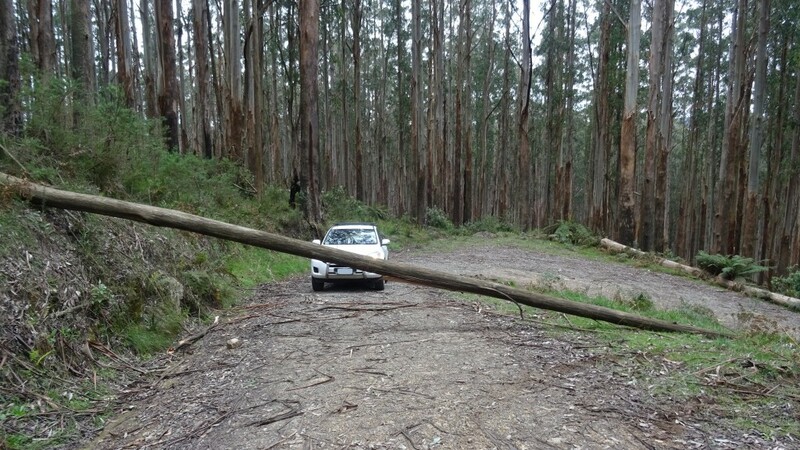 I’ve been to Mt Ritchie before with Allen VK3HRA in 2014 and I knew what the access was like. It’s mostly a gentle climb with two or three steep sections. From the gate to the summit is about 6.5 km. I arrived at the summit about 9:35 and started to set up. I took the antenna bag from my back pack, then my coat, my reading glasses, then a tarp I had purchased on the way. 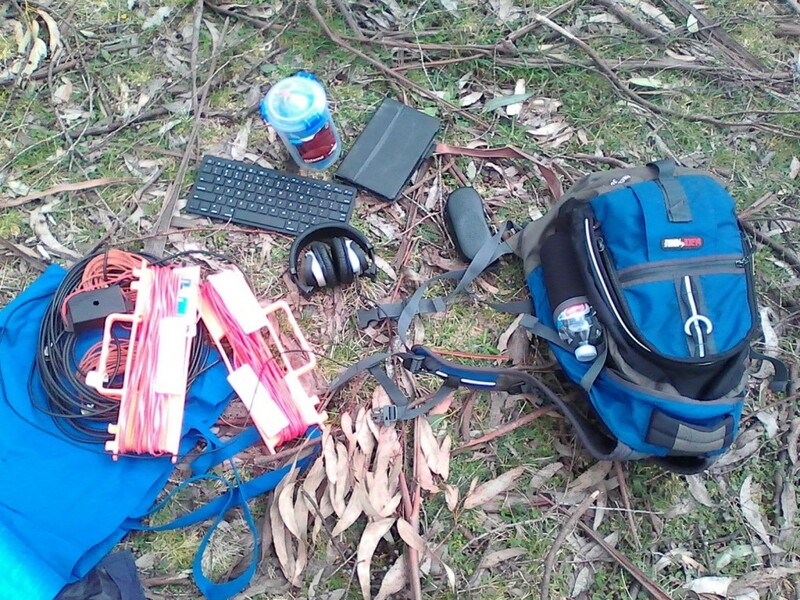 I then took out the logging tablet, an external keyboard, headphones and battery. I laid all this out under a tree limb I had chosen for the antenna. As I was tying the throw weigh to the rope I noticed something was missing. Something critical to the whole activation. I had no radio! All the equipment – except one item! With no radio I was unable to activate the summit so I packed all my gear back into the pack and, somewhat disappointed, headed back down the hill to the car. Back at the car I decided I didn’t have another 13 km of walking in me so I head for Mt Vinegar VK3/VC-005. I had activated Mt Vinegar in 2013 and the access is easy. Take Acheron Way to the north, turn left at Carters Gap Rd, pass Mt Vinegar Track and turn sharp left at Road Eight. Then follow Road Eight to a sharp right turn then a sharp left corner and stop at the gate, about 200 m from the summit. Unfortunately just after the sharp left corner there was a tree down across the path. From here to the summit was about 2.5 km and, to be honest, I just didn’t feel that enthused after my first walk for no points. So I turned around and head to Mt Gordon VK3/VN-027. I arrived at Mt Gordon at about 12:30 just as it started to rain. After a short walk I was ready to set up the antenna and noticed some wildlife nearby. 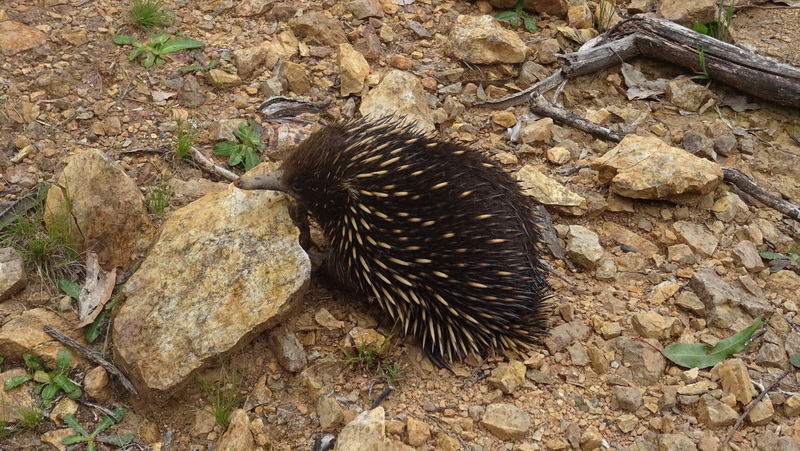 An Echidna was feasting on an ant colony and was happy to pose for photos. This was my third visit to Mt Gordon with previous activation being in snow in 2013 and heat in 2014. The rain had stopped just after I got the antenna in the air. I was on air, finally, just after 1:00 pm. As this was the last summit for the day I used my FT450D and ran it at 100 Watts. I laid out the tarp ready to cover the radio if the rain returned. I made 21 QSOs on 40m and one QSO on 20m and also got to test my VK port-a-log app with an external keyboard. I qualified the summit and added 4 points to my SOTA Activation score. At least the day wasn’t a total failure! 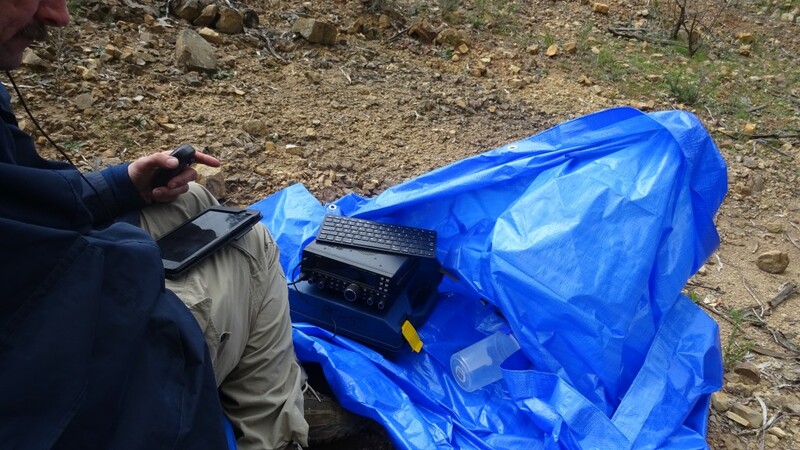 This entry was posted in Amateur Radio, FT450D, Radio awards, SOTA. Bookmark the permalink. Your photo reminded me of this day. We were delivering an equipped rack to a radio hut. It was a little easier as the hut being adjacent to the railway was downhill from the the tree across the road.